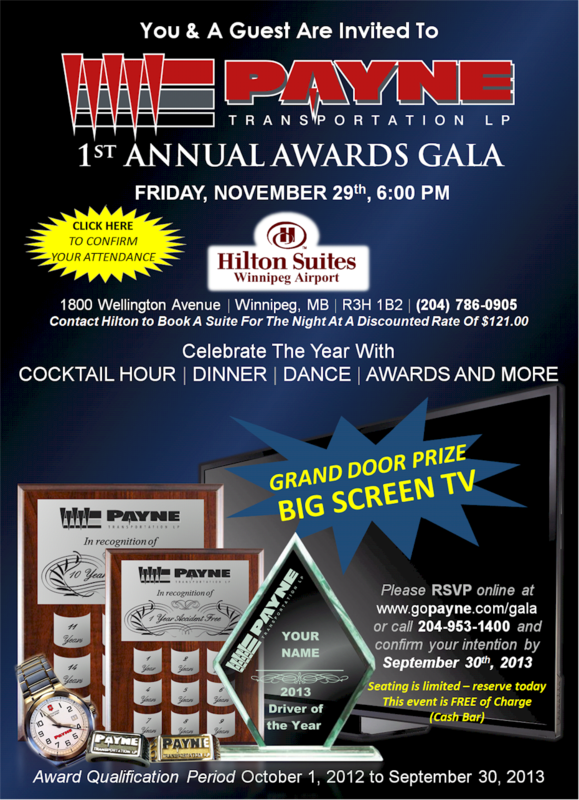 Driver Awards Archives - Page 2 of 7 - Payne Transportation Ltd. In recognition of his award, Werner receives a “Driver of the Month” jacket and a gift card for Tim Hortons. Werner is the proud owner of this gorgeous 2007 Peterbilt (pictured below). Congratulations to Conard Frampton (211) for December 2013′s Driver of the Month. Conard is no stranger to this award, he has won before and continues to show up on the list of drivers being nominated. We asked Jason McNicholl – VP – Operations and Logistics what makes Conard stand out, the response was…. “Like Father Like Son” – Conard is not alone, 3 of his sons work as owner operators within the Mullen Group of Companies. The boys finally caught up with dad and snapped a picture of the family fleet! “he is really dependable, great to work with and a huge asset”. 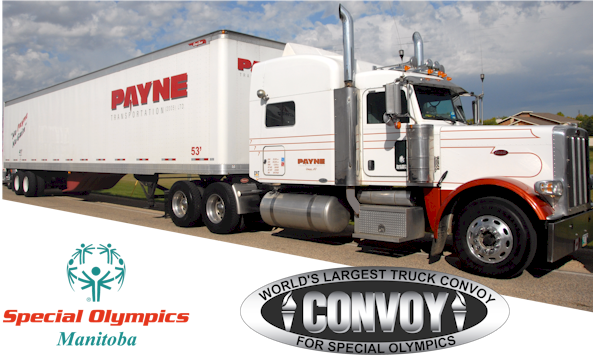 Ron has been a great ambassador for Payne, donating his time and equipment to represent our company in events such as the “Santa Claus Parade” and in the World’s Largest Truck Convoy for Special Olympics (pictured below). Congratulations Ron! Congratulations to Rae Kern (551) for October 2013′s Driver of the Month. 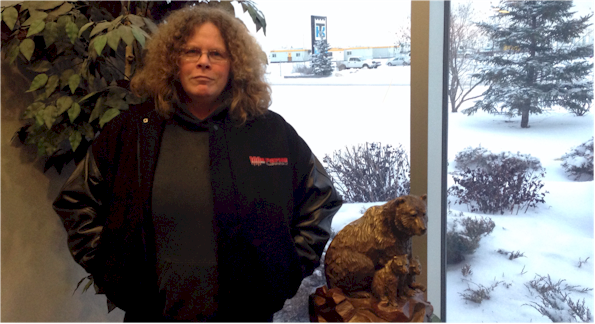 Rae drives for our dry van division, dispatched out of Winnipeg. In recognition of this award, Rae is sporting a Driver of the Month Melton Leather jacket a long with a gift certificate for Starbucks… her favourite coffee. Rae is pictured here with the Mullen Grand Prize Safety Award (GPSA) which was awarded to Payne for outstanding safety results in 2012. Glen Sharpe (3201), Ray Friesen (570), Thomas Stuttkowski (508), Terry Hiebert (3153), Piotr Zasepa (4304), Bruce Frattinger (3184), Michael Condie (189), Dwayne Blom (3908) & Greg Dinning (888). All nominees will receive a gift certificate for lunch… please contact Thomas at the Winnipeg branch for details. For those on the list that dispatch out of the Fort or Winkler, please see either Tim or Matasha for a gift certificate in your area. Congratulations to Menno Falk for September 2013′s Driver of the Month. Menno drives for our dry van division, dispatched out of Winnipeg. In recognition of this award, Menno is sporting a Driver of the Month Melton Leather jacket a long with a gift certificate for lunch at “Sun Valley” restaurant in Winnipeg. His grandson Mason was onsite to help celebrate his award. Gerald Kehler (516), Ron Webster (777), Shane Clark (3179), Dietmar & Barb Dueck (215), Herman Banman (3230), Kevin Swan (279), Jake & Darlene Hiebert (307), Rob Malo (3909) & Henry Enns (3245). Congratulations to Jean Paul (JP) Friesen) for August 2013′s Driver of the Month. JP drives for our specialized commodities division, dispatched out of Winkler. In recognition of this award, JP receives a Driver of the Month Melton Leather jacket a long with a gift certificate for lunch at “The Outpost” in Winkler. John Bekus (475), Herman Banman (3230), Brad Lidgett (3212), David Beskorowayny (112), Ray Friesen (570), Richard Treyturik (515), Bill Peters (3197), & Ron Demeule (190). All nominees will receive a gift certificate for lunch… please contact Thomas at the Winnipeg branch for details. For those on the list that dispatch out of the Fort or Winkler, please see either Tim or Cathy for a gift certificate in your area. Congratulations to Abe Giesbrecht (3191) for July 2013′s Driver of the Month. Abe drives for our specialized commodities division, dispatched out of Winkler. In recognition of this award, Abe receives a Driver of the Month Melton Leather jacket a long with a gift certificate for lunch at “The Outpost” in Winkler. Doug Hiley (53), John/Ed Loeppky (3147), Wade Conrad & Kaffy Jodrey (4166), Bill Jacobs (376), Vitali Iovu (517), Mike McMillan (369), Isaac Letkemen (3216), Wayne Nordin (3193) & Jim Bowler (3105). We have a tie! Congratulations go out to both Richard Wonnacott (3570) & Leonid Koval (518) for June 2013′s Driver of the Month Reward. Richard is no stranger to this award! Richard has been a nominee 3 times! He earned Driver of the Month in January 2012, earning his Driver of the Month Melton Leather jacket. Richard has chosen to receive a gift certificate that both he and his wife will be able to enjoy… way to go Richard! 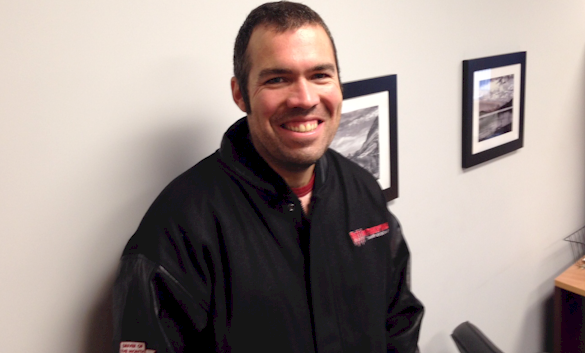 Leonid is part of the van division, and has been with Payne less than a year! Leonid has left quite an impression with all those who work with him! 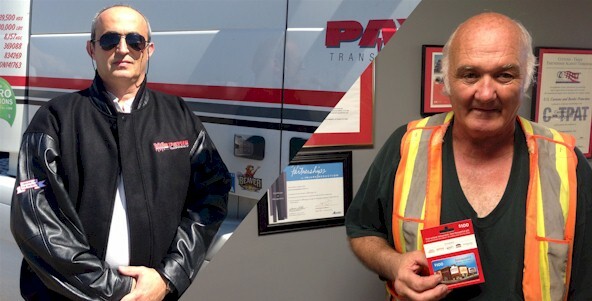 As the co-winner of the Driver of the Month, Leonid receives the Driver of the Month Melton Leather jacket and lunch at Sun Valley Restaurant in Winnipeg.